In Sichos HaRan #232, Rebbe Nachman of Breslov taught, "You are like a warrior who is prepared to breach a mighty wall. But when you come to the gate, you find it blocked by a spider web. If you returned in defeat because of the spider web, you would be the most foolish of men." 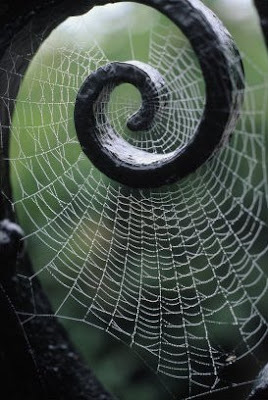 What obstacles in your life have you found were only spider webs blocking you path? How were you able to identify them as such? The Heligeh Simple Jew has a knack for asking questions that are far from simple! I have to say that unfortunately, there was many times that, in retrospect I identified obstacles as mere spider webs but failed to do so at the time of the challenge. But there were three times in my life when I was zoche to make the right decision to forge ahead, and somehow was granted the clarity to see the spider webs for what they were. And in all three cases the means of identifying the spider webs was the same, as I will explain b’ezras HaBorei. By nature, I am a very analytical, deeper type person who does not tend toward actions based on hergesh. That is not self praise, just an honest self-evaluation for the readership that doesn’t know me personally. In all three challenges (which were critical junctures in my life) I needed to rely on my gut instincts and but my natural tendencies on hold. The first was the decision to become frum. I just new it was Emes! But it was scary. Was I going to have to amputate my personality? Was I going to have to loose my family? Did I really have enough info? Libi amar li, IT IS EMES AND YOU HAVE TO DO IT! The second was the decision to leave Yeshiva. I was quite good at learning, Baruch Hashem, and I had rebbeim that were heavily urging me to stay on and to try and become a clei kodesh of some sort. In the environment I was then in, the pull and social pressure was much more toward staying then leaving. And there were thoughts of kavod mixed with some true sh’ifah to become someone great in Torah, reinforced by experienced rebbeim that saw my talents. But again, libi amar li that this is not who I am. I need to shvitz for a living. I need to live a life a bit more rooted in the Olam Ha’asiyah, as unromantic as that may sound. But that is who I am and need to be true to myself. The third cobweb-clouded decision (and think every married person can relate to this) was to marry my wonderful rebbetzin. There is no end to number of questions one can ask. And at 32 1/2, I had lots of experience in over-analyzing! One has to look not only at who the person is, but at who the person can become. And one needs emuna and bitachon. One must analyze but know that analysis can only go so far. So I would say that they key to seeing through the spider webs was the same in all these big challenges. Rav Mordechai Schwab used to say (in Yiddish) that a person needs to allow himself to be led. That means that one must live with a sense of hashgachas Haborei and to trust that He is taking me to where I need to be. Love the picture. Have a great day. Love the picture have a great day?! What about my post that I poured my heart into?! A zah chutpah! Get back here and say something about the post! Please forgive me. I hadn't had my coffee yet so there was no way I could do anything except look at a picture. It’s a miracle I made no spelling mistakes. Michoel, what can I say? It was profound, insightful, moving, witty, and honest. Your thoughts on going with your gut and not over analyzing remind me of one of my favorite expressions- 'analysis paralysis'. As I have aged I have learned to go with my gut more and the world isn’t falling apart because I didn’t spend a million years fretting over every little detail. Go figure. So I take it you did not lose your family and amputate your personality? I like that phrase analysis paralysis. Not only did I not loose my personality, I actually found it. And Baruch Hashem, I have my family that I had before in addition to my wife and children, bli ayin hara.